With over 350 webinars given, we have the experience to educate you on Parenteral Nutrition & Micronutrition via online presentations and discussions. View our previous webinar topics. Inquire about a webinar for you or your company. 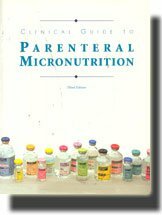 An authoritative Reference Text for Parenteral Micronutrients (Electrolytes, Trace Elements, Vitamins) to minimize medicolegal errors. A tool of questions and answers for teaching. A customizable Total Parenteral Nutrition Handbook.